I really love this quilt as well as the symbolism behind it. Your directions make it really easy too. Thanks for sharing this! This is a spectacular quilt. What lucky friends to receive this! Tremendous work. Fabulous quilt very effective! Congratulations on the finish …..just gorgeous. 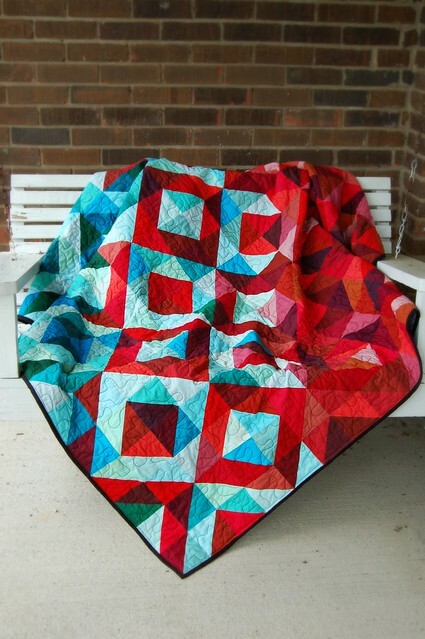 I’m sure I’ve said it before, but this quilt is so gorgeous. Your friend is very lucky. Thank you, Laura! I can’t help it, I really like this one, too. I think it’s the cool and warm together, and quilts made in solids always seem to be a favorite of mine. I can’t wait for her to have this one — I still need to get it shipped! I can see why this is your favourite! It is stunning!!!!! I love your photo shoot as well, especially your porch swing!!! Lol, thank you! :D I really do need to look around for some more interesting places to take quilt pictures, but I like the porch swing, too! 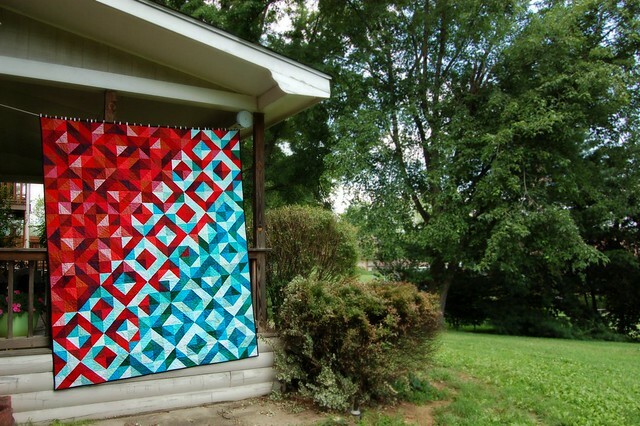 I love everything about this quilt–I strive to make a quilt this beautiful! Thank you for sharing!! Thank you so much, Marla! 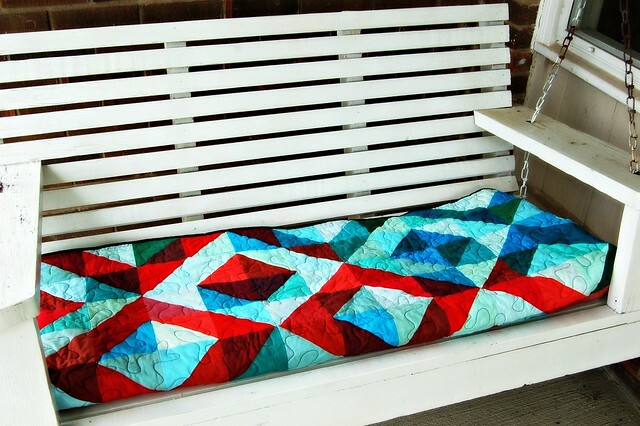 This is an easy quilt to make, I hope you try it! Beautiful quilt, putting that idea in my pile of ideas. Thanks for sharing!!! 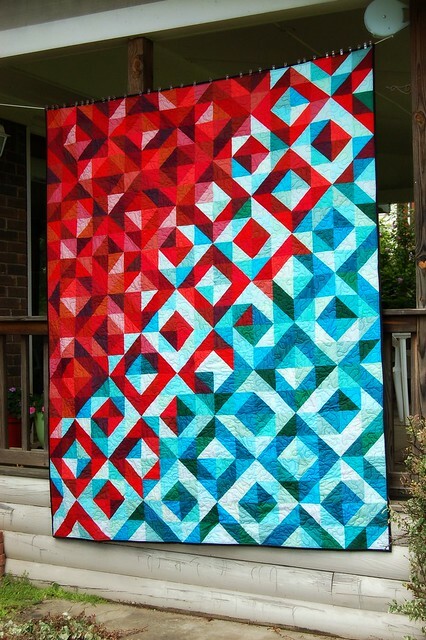 I love this quilt, your color choices are stunning and vibrant!! I have so many color ideas now!. This is so inspiring. I love the story behind it too. Maybe one day i will be brave enough to tackle it! Great job. :D ! Sorry, Kelly, this one is already with its new owner and I only sew as a hobby. I’m really glad you like it that much, though! This quilt is great. I want to do one for my mother in green, blue and purple batics. Can you tell me how big your quilt is? I would like to take 2,5” squares, and I’m not sure if they’re to small for this pattern. My quilt will be about 60″ x 80″. Hi Barbara! This quilt is at its new home, but I think it’s around 72″ x 88″. (Five inch squares become 4.5″ half square triangles, and their finished size would be four inches when using quarter inch seams, so 18 rows by 22 rows is 72″ x 88″.) If you start with 2.5″ squares, they’ll be about 2″ half square triangles, and will finish in the quilt at 1.5″. You’ll need 40 rows across and 54 down for the size you mentioned, or 2,160 half square triangles. That would be beautiful, but it’ll take a LOT of time! I’m currently making a 26″ square pillow top starting with that size squares and I’ll need 289 half square triangles. Thank you very much for your repley. I think I’ll do it. It’s a lot of cutting and sewing but that’s no problem. I’ve already done an Irish Chain with about 1800 pieces. Right now, I’m waiting for my fabric so I can start sewing. Barbara, I would LOVE to see your version of the quilt! Please feel free to share a link to pictures. I think it will be gorgeous! Hi! I would love to know if it took more than one fat quarter bundle of each color story. It is stunning! Hi Tami! One fat quarter bundle of each was more than enough. I had some scraps left over, not a lot but enough to use for a few other projects. I just finished this red flower pillow https://coopcrafts.com/2013/09/13/red-flower-pillow/ and I have used other scraps to make a pincushion and use in the sky of a “hexies pixel picture”, and I think I’ll have enough blue left to make a similar flower pillow. Just found your blog and this terrific quilt. I really like the striking contrasts. Thanks for sharing. Thank you in advance, sorry for all the questions! Hi, Danielle! This quilt ended up about 72″ x 88″. Five inch squares become 4.5″ half square triangles, and their finished size would be four inches when using quarter inch seams, so 18 rows by 22 rows is 72″ x 88″. You can easily change the size by adjusting the size of your squares or increasing/decreasing the number of columns and rows. I’m really not sure how much fabric to tell you to get. I bought two fat quarter bundles (links in the post above) and had a little left over, but it would really depend on how many colors you choose to go with. I always try to get more fabric than I think I’ll need because it’s good to have scraps. It was quilted with black thread. Sarah, I love this quilt! I am thinking of doing a similar baby quilt. With that, I have some questions! Do you think greys and yellows would work? Also, any recommendations on adapting this quilt and instructions to a smaller baby/crib quilt? Hi, Lauren! I think greys and yellows would be beautiful! (In fact, I’ve thought of making one in greys and oranges to keep for my own!) I think if I were making a baby quilt similar to this, it would be wasteful to buy two big packs of fat quarters like I did for this one unless I really had other uses for it already in mind. I’d use an ombre fabric for the variation in value, like this: http://www.vanessachristenson.com/2012/04/v-and-co-my-fabric-line-with-moda.html Scroll down and take a look at the pictures of the opened jelly roll and you’ll see what I mean. The fabric moves from dark to light across the width, so you could buy a yard or yard and a half of two colors and make a smaller scale version pretty easily. (I used green and pink to make this baby quilt: https://coopcrafts.com/2013/06/07/an-ombre-baby-quilt-ansleys-diamonds/ ) I’d really love to see your quilt, I think it’ll be beautiful! Yellow and grey version has begun! Next question! What color did you quilt the stitching along the top to quilt it actually together so it looked good on both colors, as well as the black on back? Hmmm, and also — I might make all the blocks a mix of gray and yellow, pairing darks, mediums and lights together. Then I’d place the blocks so that the darker colors were at the upper left, becoming lighter to the middle, then dark again at the lower right. But just a thought! Wonderful, Lauren! I can’t wait to see it! For this quilt, I went with black quilting. I wanted something a little dramatic and thought it would tie in with the black binding, too. What a fantastic quilt! Thanks so much for sharing your process. I’m putting this on my list to make … and SOON! I instantly fell in love with this quilt and started buying fabric immediately after seeing it! Instead of buying fat quarters I bought hombre fabric. 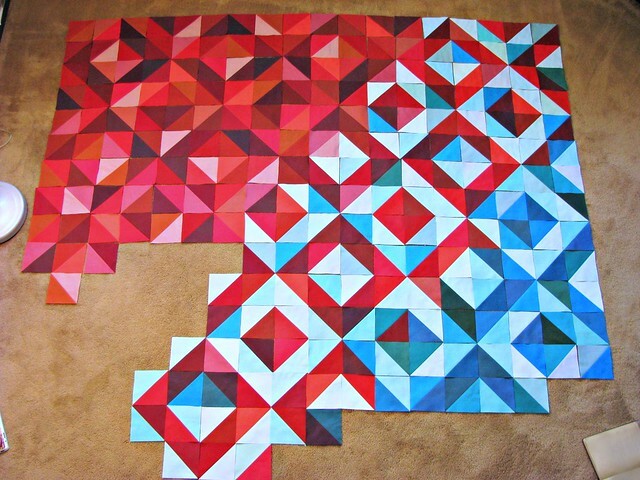 Call me crazy… I’m doing the quilt in 2″squares which turn out to be 1 1/2″ when finished. It will take me quite some time to finish but when I do I will send pictures! The best way to do it for me was to draw it on a piece of graph paper so I can check off the rows after I see them together. Thank you so much for the great tutorial and idea! Hi Corry! Nice to meet you, and sorry I’m so late responding. I love that we like so many of the same quilts and fabrics, that’s awesome! 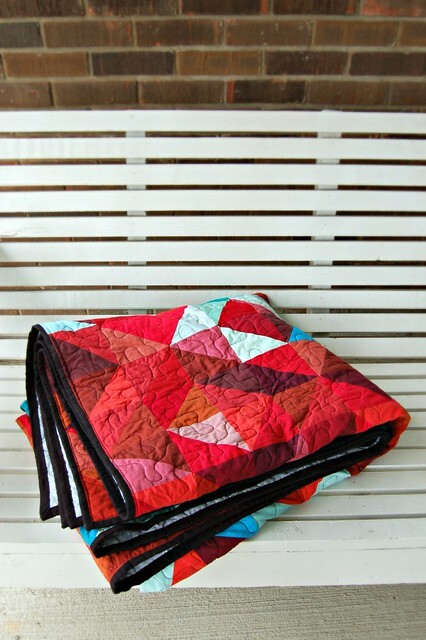 I think the Lava Meets Sea quilt would be BEAUTIFUL in reds, oranges and yellows with purples. I’d love to see a picture of it, and all the rest, plus any others you make! Do you have a blog, or a Flickr account where you share your quilt pics? Please let me know how it all goes, and let me know if you have any questions — I’ll try to be quicker responding! Hey Sarah, no worries. I am just in the process of setting up a Flickr account now, so it may take awhile to figure out all the bells and whistles, but as soon as it’s up, I’ll let you know. I don’t have a blog because I just don’t want to bother with keeping up with it. For now, I’ll just try the Flickr account. Oh, yeah, I decided to call my quilt, ‘Prairie Sunset’. It represents all the beautiful sunsets I have been witness to while growing up as a child in Saskatchewan, Canada. I found this quilt picture via Pinterest (which directed to your flickr account, thanks SO MUCH for linking it to this post!! I hate not being able to find the quilter!) I had to just take a moment to say how gorgeous it turned out. I agree with the earlier posters, your friend is very lucky! I also really appreciate the tips and insight into how you arrange your quilt. Thanks so much for sharing the tips, how-tos, and the finished product! Hi Elizabeth, and thank you! I have the same pet peeve if I can’t find more information on a quilt or pattern that I like. So much better when I can click through and learn more! This quilt is beautiful, absolutely stunning. It immediately jumped over everything else on my to-do list. I’m making it in greens and blues by request and ran into a question right out of the gate. Did you use every hue in your fat quarter bundle? I ask because now that I see a grecian waters bundle in person, it appears to have some greens (3-4 shades) in it and your photos don’t reflect that on my monitor. I really hope to do this pattern justice and hesitate to use green on both sides. 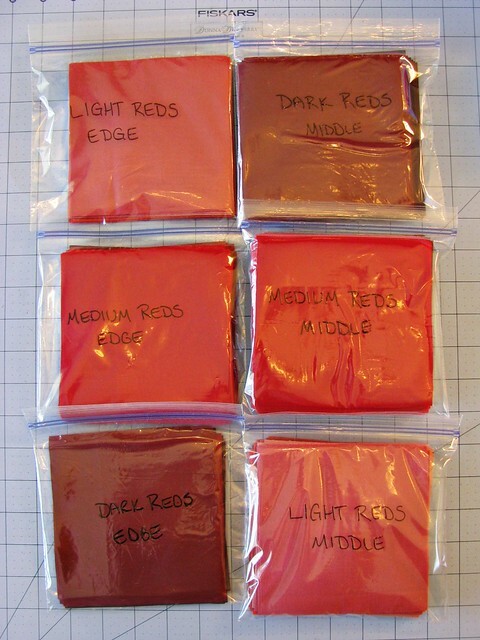 In an earlier answer, you said that you had “little left over” but I cannot quite discern how many shades are there. I could be doing the math wrong, but I have 46 fat quarters (two bundles) and think the minimum needed is 33? Hi Chelsea! Yes, I used every single hue in both fat quarter bundles, even the greens. I wanted to have a good variation of colors and the greens really helped give “sparkle” among the blues and aquas. I did use a little more of colors I liked and less of those I didn’t, but that was just personal preference. Keep in mind too that you’ll have to carry the color value through the section where the colors meet, so you may need more from the dark reds and more pale blues. It’s really hard to say how much I have left over because they’re little scraps. I used some of the leftover reds to make this pillow https://coopcrafts.com/2013/09/13/red-flower-pillow/ and I have two gallon sized bags filled with the scraps from the rest of the reds and blues. this is beautiful! I love the colors you chose and how you make the values flow across the quilt. I’ve made a few of these, my most recent was a red/white/blue one, and i’ve also done a blue/green/yellow and also an all-color one. It’s so fun to make, and really not that hard to make the half-square triangles, and can have such a pleasing result. i like the idea of using solid colors = i’ll have to try that next time. mine have all been with prints. Beautiful quilt!! Did you use all the variations of color in both the red and blue fat quarters? Hi, Erin! Yes, I used at least a little of everything, but more of the colors I liked best. It helped to have a red bundle that was a good bit darker than the blues, to help through that middle section. Thank you, Leah! I love making half square triangles, too, and they are always so striking! I didn’t have much use for solids when I first started quilting, but they’ve really been a favorite lately. They really are versatile, and can be soothing or exciting, will fit whatever mood you want to express. I’m attempting a teal/red batik rendition. Please see my blog post @ http://quiltingmod.blogspot.com/2014/05/half-square-triangle-quilt.html. I need to do some shuffling, but I wanted to get something up on the design wall, and shuffle HSTs from there. I absolutely fell in love with this quilt & I am going out today to buy fabric! I’ve never done one in complete solids since I’ve always been a fan of prints but the colors & design of Lava meets Sea is just stunning. I can’t wait to get started! I’m currently making my own version of this quilt, is it okay if I use one of the pictures of your version in my Blog post about it? I would link back to your site. This is stunningly fabulous. Thank you for sharing. I now know what next winter’s project looks like. Hi Sarah. I am new to quilting and I’d like to know, did you plan every piece or did they just “fall into place”? What kind of pattern do you recommend for me to try this? Thanks! Hi Danelle! I just let them land wherever. Step back and look every now and then and move them around if you like before you sew. I’m not sure what you mean by what pattern, though? I made it for my boyfriend’s cousin, who is pregnant. At the time that I started making it I didn’t know if the baby was a boy or a girl, but I figured this color combo would work well for either. I was so struck by the colors and the pattern, I couldn’t resist. That sounds beautiful, Laurel! Enjoy making it! id like make this. Not sure of size and yardage for each color of fabric. I’m a little past a beginner at this. Is there a pattern I can purchase? Hi Linda! This is a free tutorial, so there’s no pattern to purchase. For the fabric in mine, I used two different fat quarter bundles. (They are linked in the post but since the post is now a couple years old, you may need to search for new sources. Both bundles are still available, just maybe not from the same shops I used at the time.) Fat quarters are a quarter yard of fabric, cut “fat”, a quartered yard of fabric rather than one that is cut in four long skinny strips. 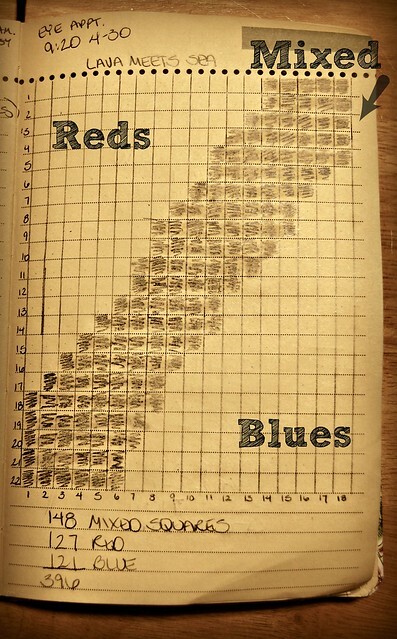 The blues I used had 23 fat quarters, or 5.75 yards of fabric, and the red had 21, or 5.25 yards. I do suggest a large assortment of colors to make this look, and the bundles just make that really easy. 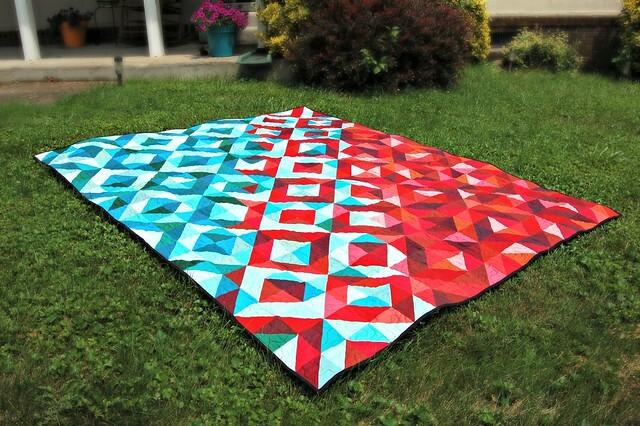 Half square triangles are probably the simplest quilt block, so I think even a confident beginner can tackle this quilt. The magic is mostly in the layout, so take your time and think about the look you want as you’re choosing fabrics. Hello! I simply love this pattern! I wanted to ask you how many colors you used of the red and blue fat quarter bundles? I am trying to match this quilt to a new rug and plan to use reds and golds. 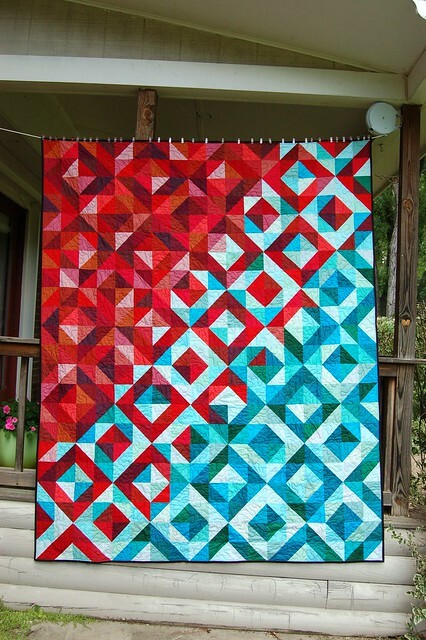 As I many not find the perfect fat quarter bundle, I may need to coordinate fabric on my own and would love to know exactly how many shades you used for both the Reds and blues. I have tried to count from your post but I think I may be off. I also love in Africa and only receive one shipment a year from the states so I would really appreciate some help! Hi Melody! I had to go back and look at the post, it’s been a couple years and I didn’t remember how many fat quarters I used. There were 21 in the red bundle and 23 in the blue. Using red and gold will be beautiful! I’d love to see pictures of it later, and good luck with finding your fabrics! Beautiful. About how many fat quarters does this project require? Just ordered fabrics today. Going to make this for my in-laws. My FIL loves red and their favourite place to vacation is Maui Hawaii. Thanks for the wonderful quilt inspiration. Awesome design. How many squares did you have for the different shades? Hi Kayla! How many squares from each color? I have no idea! I made more of the ones I liked, less of the ones I didn’t care for so much. ok. I was trying to make sense of your fabric requirements. I read through some your comments and I sort of understand what I need to make this quilt. To echo comments above, this is indeed a beautiful quilt. I’m having trouble comprehending the ratio of darks, mediums, and lights used and how you mixed them. Is there a method to the madness or is it somewhat random? Did you have equal amounts of each? How did you decide how many darks to mix with mediums and darks to mix with lights and mediums to mix with lights, etc.? Hi L! If it makes it easier, you can think in straight terms of dark/light for each square. From the post, “Then you’ll want to make 127 red blocks, 121 blue blocks and 148 mixed blocks for the middle.” So for each red block, you’d want one light red triangle and one dark red, for each blue you’d want a light blue and a dark blue, and for the mixed blocks, dark red and light blue. I like adding in the “medium” because they can be flexible, they’re the ones that were kind of in between and may function as a light next to the darks or as a dark next to the lights. Remember, quilting is just expressing creativity, so as long as you like the look of it, it’s right. Thanks, Sarah! That helped a lot.